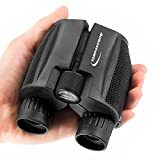 i Click 'view all' to instantly compare this fantastic deal with offers on other top binoculars. 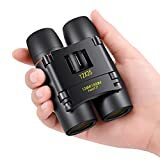 AUCEE Bird Watching 30x60 Mini Binoculars Compact Adults is currently selling at $13.99, approximately $1.23 lower than average, giving a potential saving of $2.00 right now. With a lowest price of $13.99 and an average of $15.22 it is selling on the low end of its usual range. Price volatility is 0.3% (meaning it does not change often), so the price should stay low for a while. Right now this product is a recommended 'fantastic deal'. There is a coupon available for an additional 10% off. The current deal is also the best price on this item over the last month. 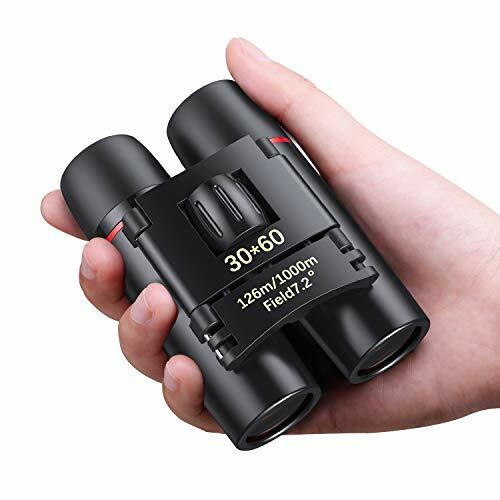 Compare the current price, savings (in dollars & percent) and Buy Ratings for the top Binoculars that are closely related to AUCEE Bird Watching 30x60 Mini Binoculars Compact Adults. Here is how AUCEE Bird Watching 30x60 Mini Binoculars Compact Adults compares with other leading Binoculars. Give you the best experience and bring the world closer. Enjoy a detailed view with "AUCEE" 30 x 60 powerful binocular, with a magnification 30x, bring subject 30 times closer. With the object lens diameter 60mm, it allows more light to come through, more clear details, even at low light condition. Multi layer-coated aspherical lenses elements for Light reflection and minimal distortion, better image brightness, contrast and quality. With field of view angle (7.2 degree, 126M/1000M) it has a large field of view, good for watching fast-moving things. Built with a rugged exterior, come with carrying case and strap make it easy for carrying. Advantage? 30mm diameter eyepieces, more comfortable Compatible with tripod(Not included) Fully adjustable for adults Clear vision Ideal magnification 30 x 60 Great distance range Amazing mate design, with grip areas for an easy hold Specification: Model: 30 x 60 Eyepiece Diameater: 60mm Type Of Prism: BK4 Lens Coating : FMC Focus System: Cent Focusing Lens: Eye Exit Pupil Diameter: 2.5 Field Of View: Angle: 7.2°, 126M/1000M Diopter System: Right eyepiece Eyecups System: Twist-up Applications: Outdoors, bird watching, climbing, hiking, sightseeing, traveling, sports, games,concerts,etc. In the Box: 1 * Binocular 1 * Cloth bag 1 * Strap 1 * Cleaning Cloth 1 * Manual Notice: 1. Do not look directly at the sun through a telescope, otherwise it will hurt your eyes. 2. Please put it in a dry place if it is long term unused. 3. Wipe the lens with dry and clean cloth. If there are some stubborn stains, please use the cloth dipped some alcohol. It would be easy to remove. 4. If you have any problems, you could e-mail us directly by Amazon with order ID. Features?30x60 High Power Magnification?binocular with Full 30x magnification and 60mm objective lens diameter offers maximum image brightness in low-light and long-range conditions?HIGH QUALITY BAK4 LENS with Clear Image?To minimize UV glare with a strong optical lenses,FULLY MULTICOATED OPTICS guarantee superior light transmission and brightness with increased contrast and resolution. 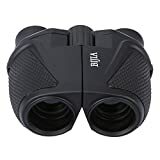 ?Large Field of View?field of view: 7.2 degree, 126M/1000M, good for fast moving subject.Perfect for adults bird watching,traveling,sightseeing, hunting, wildlife watching, hiking,sports events, etc. and it is also a best gift for adults, kids, chindren. ?Ergonmic Design Specials? all-metal construction is very durable, high-grade pure rubber leather feel comfortable,It is a perfect gift choice.